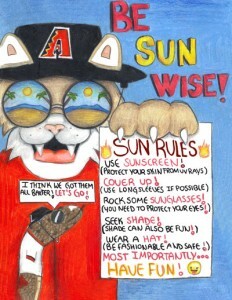 The SunWise Program held its annual presentation of the “Be SunWise & Play Sun Smart Skin Cancer Prevention Poster Contest” on Saturday, May 5 at the Arizona Diamondbacks vs. the Houston Astros baseball game. This year marked the 15th year of the annual poster contest, which invites students from all over the state of Arizona to showcase their sun safety knowledge and artistic skills. The partnership of the Arizona Department of Health Services’ SunWise Program with the Arizona Diamondbacks highlights the important health issue of skin cancer in our state, and facilitates skin cancer awareness for Arizona youth. Our first place winner, Grecia Solorio, from Wade Carpenter Middle School in Nogales, scored a home-run again this year for the second time in a row with her creative and colorful poster illustration. Her poster depicted D. Baxter the Bobcat and a diamondback rattlesnake in a sunny beach sharing sun safety tips for all to be safe in the sun and have fun. The second place winner was Briana Quintero, a 7th grader attending San Tan Valley Heights. Her poster depicted player Paul Goldschmidt “Going for gold with Goldy” with a rainbow of sun safety tips to prevent skin cancer. Zayleen Perez was our third place winner attending 1st grade in Stevenson Elementary in Douglas with a poster depicting a fun day at a Dbacks game, stadium and all. With a very detailed poster for her age, Zayleen won over the hearts of the Diamondbacks choosing the winners. Brian Donnelly from Wade Carpenter School, Molly Williams from San Tan Heights, and Bernadette Gonzalez from Stevenson Elementary school were all in attendance to support their students. All the winning students and their teachers were invited down to the field to do an official announcement. The primary focus of our SunWise Program is educating school aged children of the dangers of overexposure to UV rays, and most importantly, how they may protect themselves from such dangers, such as regular use of sunscreen with SPF 15+, wearing a wide-brimmed hat, and covering up to name a few. 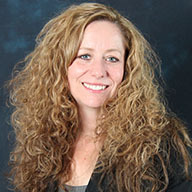 For more information, please visit the SunWise homepage, or to request a presentation email the program.